Gitte: Sometimes you start a book and you’re just not feeling it. It starts as many before it and you’re reading thinking, I’m just not sure about this one. It’s okay but nothing unique and there’s no emotion that sets it apart from any other ‘okay’ stories. Well this is how I felt through the first half of Because of Ellison, I just wasn’t feeling it and when I had to put it down a few times I wasn’t rushing to pick it back up. The prologue was intriguing yet what followed just didn’t grab me, it just was what it was. Then….then something happened and the tone, the emotion and the quality of writing went from zero to a hundred in one scene. That’s right one scene and I was hooked. Suddenly it was as if the Author woke up and wrote from the heart and her own emotions made an imprint on every single page. Her characters suddenly came into their own, they showed such depth, the story became bigger than what it was and the writing became superb. All, I guess, because real, raw and pure emotion entered the equation. Now, I have to admit that I guessed where this story was going from the onset and I predicted how it was going to end. However, once it truly got going this did not matter one bit because it was class, pure class in how it got there and I haven’t cried like I did for a very long time. Pure ugly can’t leave the house crying! This Author pulled it right back for me turning something okay-ish into something wow! Amazing really and just goes to show the quality of this story and how the Author by injecting herself and emotion into it turned it all around. Suddenly I was inhaling every word amongst my tears and by the time I got to the epilogue, well I was in a messy puddle on the floor hiccupping through my tears. That epilogue has to be one of the most beautiful and astounding epilogues we’ve ever read right, Jenny?! Jenny: I was the same G. I was actually enjoying Because of Ellison in the beginning although Ellison herself frustrated me at times, but I wasn’t being wowed. Having said that, there was no way I was going to put this book aside because that prologue absolutely guaranteed that I would be there right to the end. The prologue actually gave me goosebumps when I read it. I HAD to know how the story arrived at that point. Then, as you said, somewhere around the 50% it changed and I couldn’t move until I finished it. It gripped me and all else melted into the background until I completed what was to become one of the most moving books I’ve read for a while. THAT epilogue. Words fail me. It took me longer to read that epi than it did the whole book, as I paused numerous times to wipe my tears – and it wasn’t just tears. Like you I sobbed. In fact, this book consumed me the whole day after I read it. It made me look at life and take stock, and when a work of fiction encroaches on real life, well..you know you’ve just been privy to something truly mesmorising. Such a beautifully told story of first love, self enlightenment and finding your way. What started out as a sweet and flirty read soon became an intensely emotional story and the latter of this book felt so personal, as if the author herself poured her heart and soul onto those pages and I felt every single word she wrote as if she wrote them specifically for me. It was moving and I will never forget the feelings I experienced reading this absolute gem of a story. Gitte: Right, so Hunter; a spoilt nineteen year old rich kid who lives to party, shag and do drugs yet is highly intelligent and methodical. He’s a mess and has no real dreams or inspirations in life. Time out is called and his parents send him to stay with his Uncle in an environment at the opposite scale of what he’s used to. I didn’t really have an opinion of Hunter to begin with, he didn’t impress me and I didn’t really connect with him, though I somehow knew there was more to him than meets the eye with the way he dealt with what was thrown at him. Then Ellison happened and this boy shed the superficial obnoxious arse layer and came into his own, taking control and becoming so much more and then some. I don’t want to give any spoilers about Hunter, however, him coming into his own is what had me devouring this book and changing every bit of my initial opinion. Hunter stole my heart through his beautiful actions, his words, his caring and his understanding of life and being able to appreciate silence for what it brings. His reaction to a devastating situation as a consequence of the sweet, inspirational and beautiful person that is, Ellison James. Ellison, though she grated on me to start with, became magnificent didn’t she Jenny?! 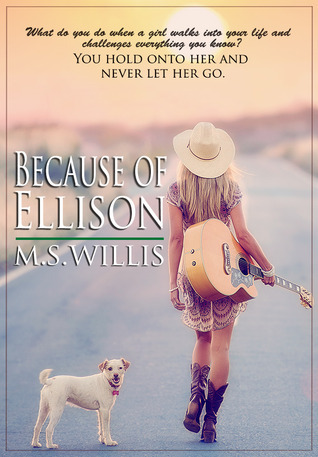 Jenny: Ellison was such a contradiction to begin with and I wasn’t sure how I was going to connect to this strong willed, bull headed young lady with the wicked sense of humor who possessed a playfulness and wickedly clever and devious mind. She was loyal to a fault though and I admired her tenacity, but oh she could be a little madam at times. She could be extremely obstinate at times, and her behaviour towards Hunter tended to grate on me but I understood her reasoning was purely selfless and that her rationale was to protect those she loved and her actions were in fact selfless and in the end she completely won me over and I adored her. What this young woman dealt with in her young life was extraordinary and she too was an extraordinary girl. No wonder Hunter fell head over heels for her. He could see beyond the hard exterior, he could see the beautiful, giving, compassionate and passionate woman under her bravado. Their love story was unique and it was captivating and I loved every moment. Theirs was a special bond, a special love. G&J: Even though we started off perhaps not overawed or wowed it became the exact opposite towards the end. We read in awe and yes we loved with aching hearts and tears in our eyes. Because of Ellison is like a journey of discovery, if you will, where you start off in a familiar territory yet the path takes you down a road you’ve not travelled before with new emotions, sights and thoughts. You’re wowed and something recognizable turns into something unique that leaves a lasting impression on your heart and mind. This story is one of new discoveries, self-realisations, friendships, hope and ultimately love. The subject matter is one we have all been touched by and the emotion with which is written is extremely powerful and the actions of Hunter and Ellison remarkable in their own personal and unique way. It turned into an absolutely beautiful journey after a slow start. A journey we can highly recommend! The Epilogue being so extremely poignant and inspiring that it will stay with you for a long while after.